Knowing that collectd is a daemon that collects system and applications metrics and that Gnocchi is a scalable timeseries database, it sounds like a good idea to combine them together. Cherry on the cake: you can easily draw charts using Grafana. While it's true that Gnocchi is well integrated with OpenStack, as it orginally comes from this ecosystem, it actually works standalone by default. Starting with the 3.1 version, it is now easy to send metrics to Gnocchi using collectd. The detailed installation procedure for Gnocchi is detailed in the documentation. It among other things explains which flavors are available – here I picked PostgreSQL and the file driver to store the metrics. Once done, just run the gnocchi-upgrade command to initialize the index and storage. Collectd provides a default configuration file that loads a bunch of plugin by default, that will meter all sort of metrics on your computer. You can check the documentation online to see how to disable or enable plugins. That is enough to enable the storage of metrics in Gnocchi. across 0 metrics wait to be processed. written in the documentation): using uwsgi is a better option. However for rapid testing, the gnocchi-api daemon is good enough. If you have any problem launchding colllectd, check syslog for more information: there might be an issue loading a module or plugin. Once everything runs, you can access your newly created resources and metric by using the gnocchiclient. It should have been installed as a dependency of collectd_gnocchi, but you can also install it manually using pip install gnocchiclient. If you need to specify a different endpoint you can use the --endpoint option (which default to http://localhost:8041). Do not hesitate to check the --help option for more information. 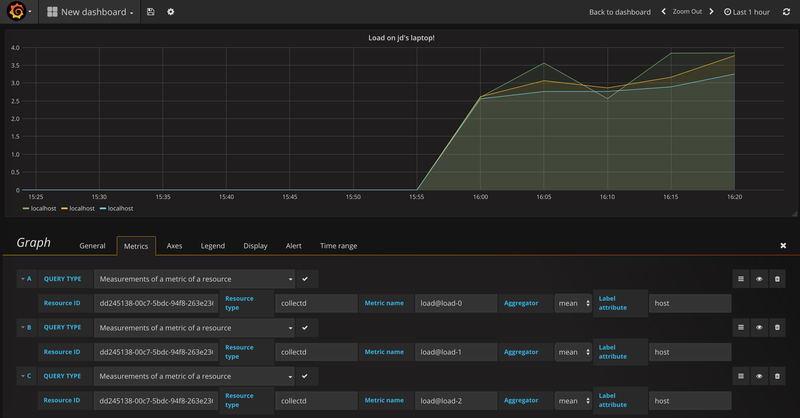 As you can see, the command line works smoothly and can show you any kind of metric reported by collectd. In this case, it was just running on my laptop, but you can imagine it's easy enough to poll thousands of hosts with collectd and Gnocchi. I hope everything is clear and easy enough. If you have any question, feel free to write something in the comment section!